I'm trying to get much better about cooking, so I'm always perusing Pinterest for new recipes. I'm always telling SW I've found something new to cook, but he always jokes, "When am I going to see it?" Hilarious, I tell you. 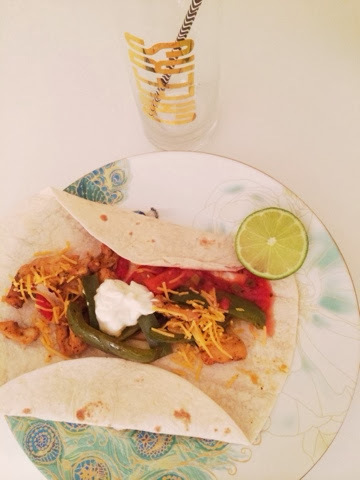 I adapted this chicken fajita recipe that I found on Pinterest and made it my own, and the first words out of SW's mouth when he tried it were, "Oh my gosh, these are so good." I was feeling pretty good about my cooking abilities (until I remembered how easy this recipe is!) It's also a "skinny" recipe so it's relatively healthy, too. 3. In a glass casserole dish, add chicken and vegetables, evenly mixed. 4. Pour olive oil over the chicken and vegetables and stir. 6. Sprinkle onion powder and cayenne pepper over the entire mixture - careful with the cayenne pepper! 7. Stir chicken and vegetable mix so that everything is equally coated. 8. Bake at 400 degrees for 45 minutes, stirring around halfway. Optional - if you want this fajita style, it is now complete! We also tried grilling it in the George Foreman grill for a couple of minutes, and they turned out great! 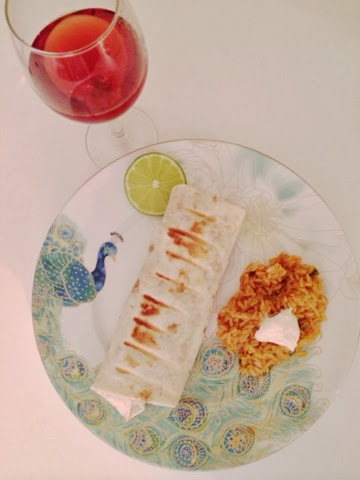 I paired my fajita with a glass of red wind and a side of Mexican rice, and it made a wonderful meal. Side note: We're supposed to get somewhere between 5 and 11 inches of snow here today. I don't think we're going to know what to do with ourselves!